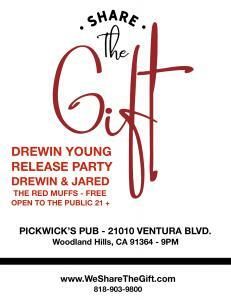 "LA SINGER SONGWRITER DREWIN YOUNG RELEASING 'SHARE THE GIFT' SINGLE & MUSIC VIDEO DEC. 20, 2018"
Release party Dec. 21st, 2018 at Pickwick's Pub-Woodland Hills, CA. LOS ANGELES, CALIFORNIA, USA, December 6, 2018 /EINPresswire.com/ -- Drewin Young is an American musician, singer and songwriter born in Northridge, California. His heartfelt single and music video “Share The Gift” is officially available via Apple Music, Amazon, Spotify and YouTube on December 20, 2018. Stream and share the music video by clicking here. The release party (open to the public) for the single and video is December 21st, 9pm at Pickwick’s Pub (2010 Ventura Blvd, Woodland Hills, CA 91364). Drewin attended the University of California, Santa Barbara (UCSB) and earned his degree in Film Studies in 2004. While enrolled there, Young was schooled in the art of the film industry by Desperately Seeking Susan Producer Sarah Pillsbury and studied music supervision via Four Rooms director Allison Anders. Drewin’s film Express Lane won Best Music Video Award at the International Student Film Festival, Hollywood. He also went on to win two more awards for his next short music film The Irish Cowboy at Moondance International Film Festival & Backlot Film Festival. The Irish Cowboy is the accompanying digital b-side to “Sharing The Gift” and will also available on Dec. 20th. 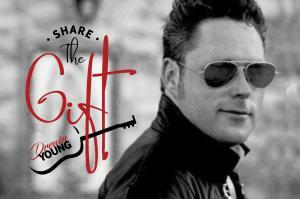 “Share The Gift” is a song about “love and charity” says, Young. “My wish is that the song and video will inspire others to help and share with others in need this holiday season. We shot the video in various locations throughout Mexico, and seeing the happy faces and voices when we brought them gifts will warm your hearts as it did mine. It’s important to help others not only during the holiday season, but all year long. There are so many people hurting in the world, and whatever we can do to bring some sunshine into those in need, is a good thing for our world,” says Drewin Young.